My husband has been in between jobs, and started a new job on Monday. I wanted us to have one more family outing before he went back to work, so a week ago Friday we went up to Whidbey Island to poke around. 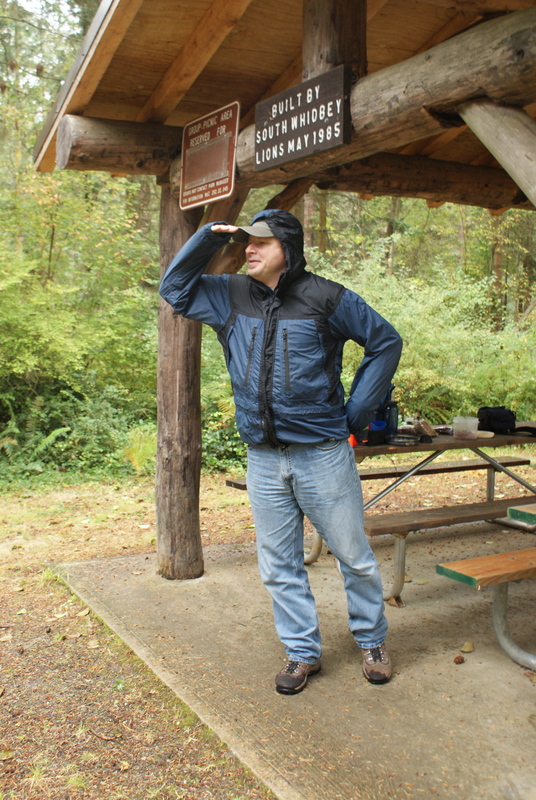 We thought we might check out some trails, but the rain and wind were too annoying, and we ended up just checking out a few different parks. 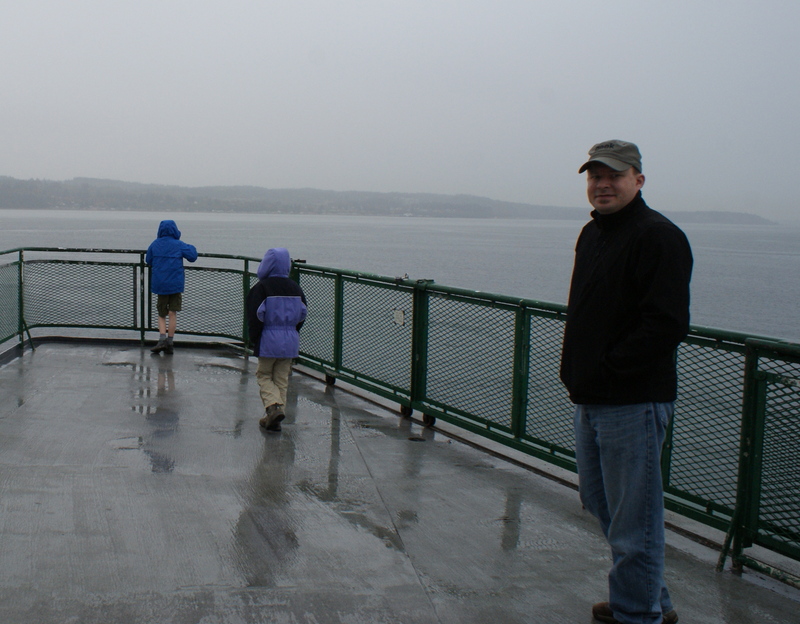 Our journey started on the Mukilteo Ferry. We saw a seal and a bunch of sea birds on the short trip over to Clinton. 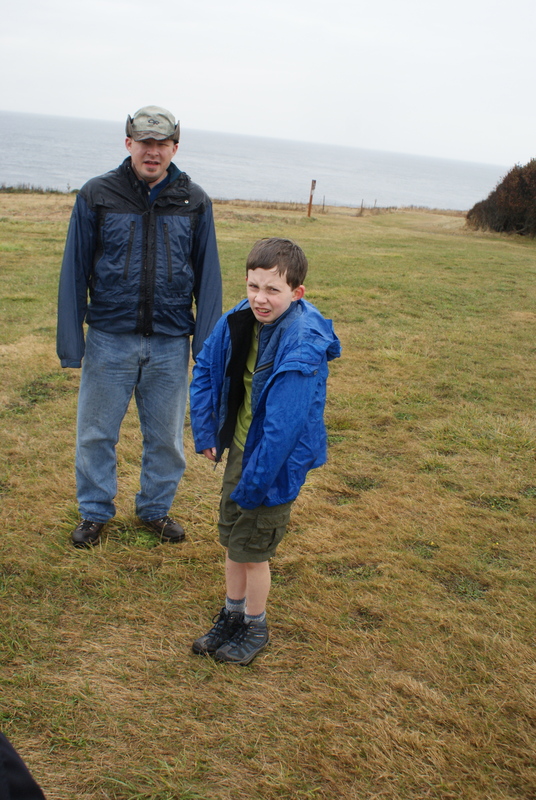 Then we drove up Hwy 20 to Fort Casey, our first destination. Old Bunkers at Fort Casey. I had trouble keeping the lens dry. 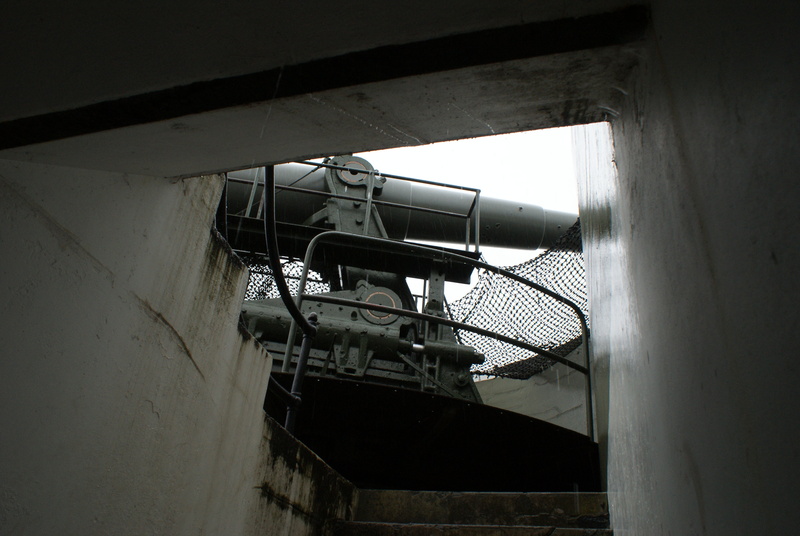 This State Park was formerly a military base, and has interesting old bunkers and gun emplacements to explore. Annika was less than thrilled about being there – she wanted somewhere greener and more beautiful. But Daddy and Gabriel were interested in walking all over the bunkers and checking out the abandoned rooms. 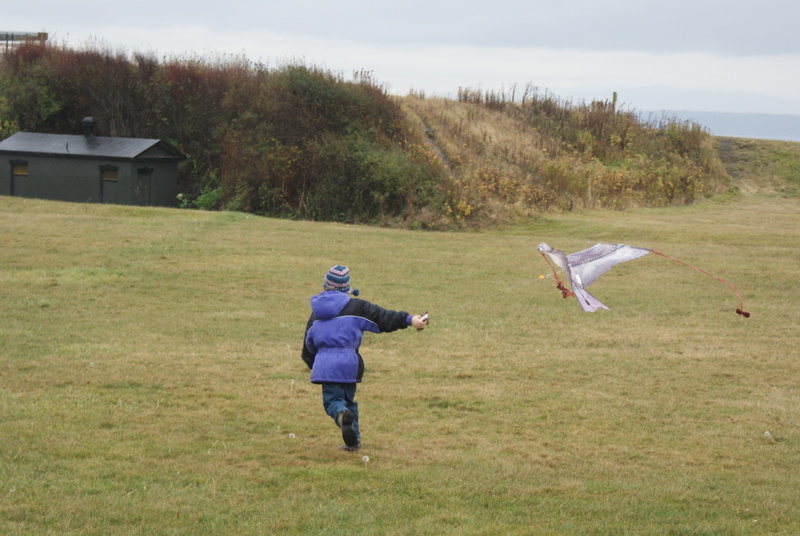 Annika and I explored for a bit, and then we got out her raptor kite. It was the first time we’ve had it out where there was enough wind to fly it. Gabriel didn’t want to put warm clothes and his full rain gear on. He was wandering around in shorts and a t-shirt, with a jacket not zipped up, under his rain coat, also not zipped up. By the end of our time there, he was soaking wet and cold. I did have extra warm clothing for him to change into, but I thought it was a safe opportunity to let him have his way and not fight him in his decisions. I think it turned into an effective learning situation. 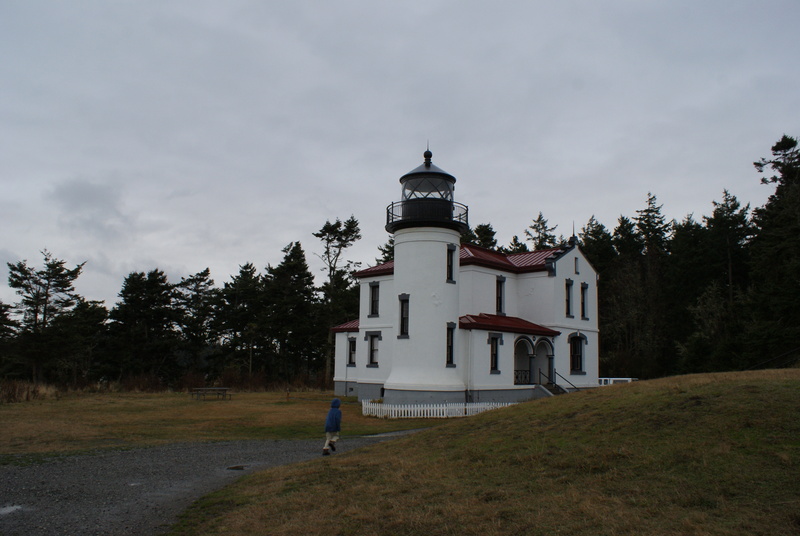 There is a neat lighthouse at Fort Casey, too. It is only open for tours on weekends, so we just took a few photos and retreated back to the warmth of our car. 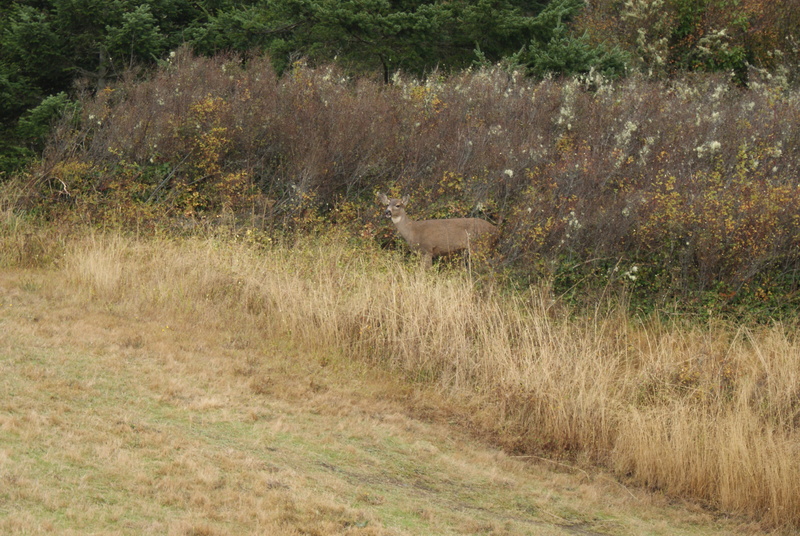 There were two deer feeding in the shrubs there. On the drive up to Fort Casey, we had passed through Keystone Spit State Park, and we went back down there after we explored the Fort. 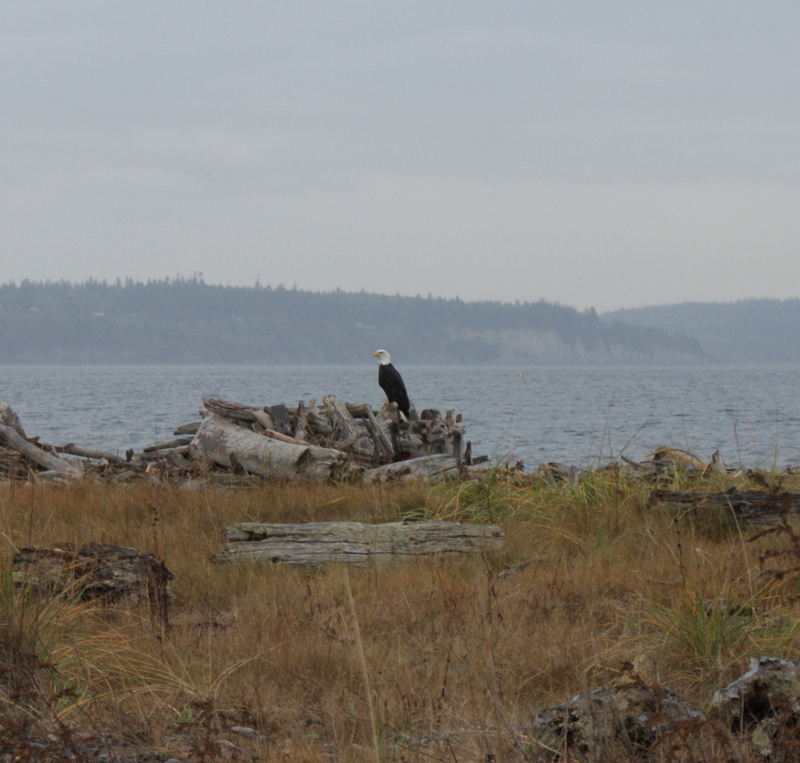 Bald eagles were perching on the driftwood, and we were able to get close enough for a photo before they flew further away. We also saw a Northern Harrier hunting on the spit. Over on the Crockett Lake side of the spit, there were many herons poised and waiting to catch their prey. There are some interpretive sings on the northern end of the Park, telling about the formation and history of this interesting area. 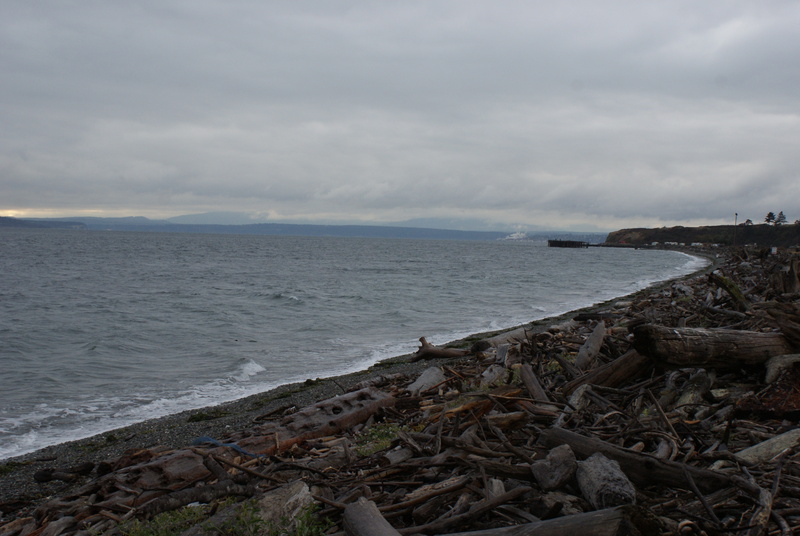 After we poked around here a bit, we continued in the car to South Whidbey State Park. 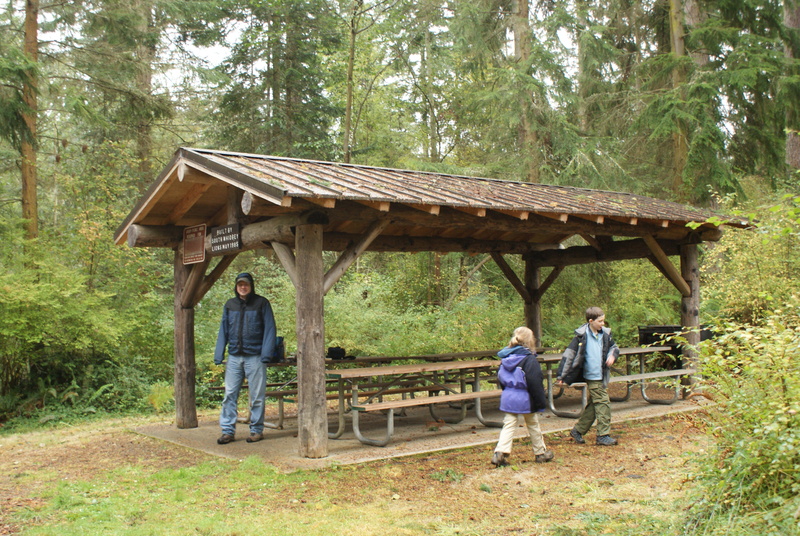 They had a covered picnic shelter there where we could get our little stove out and make hot cocoa. 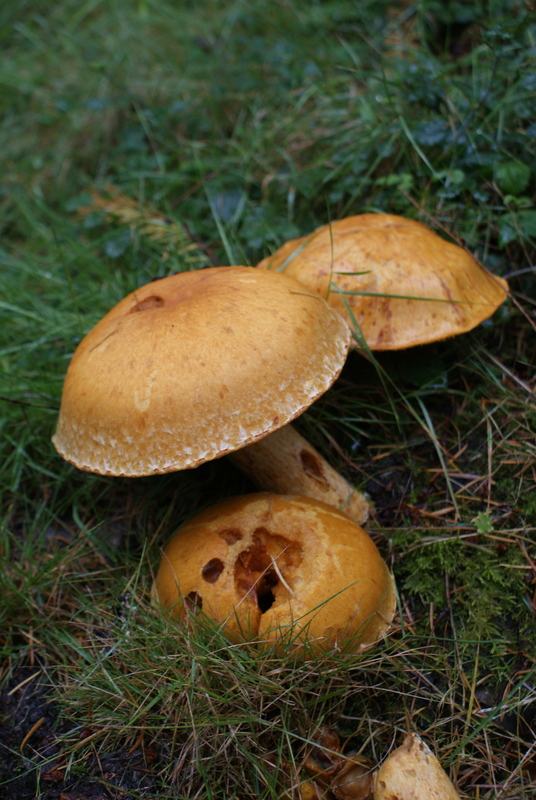 The kids enjoyed running around in the forest and playing some kind of make-believe game. We tanked up on snacks and just soaked in the green scenery and the fresh forest air. 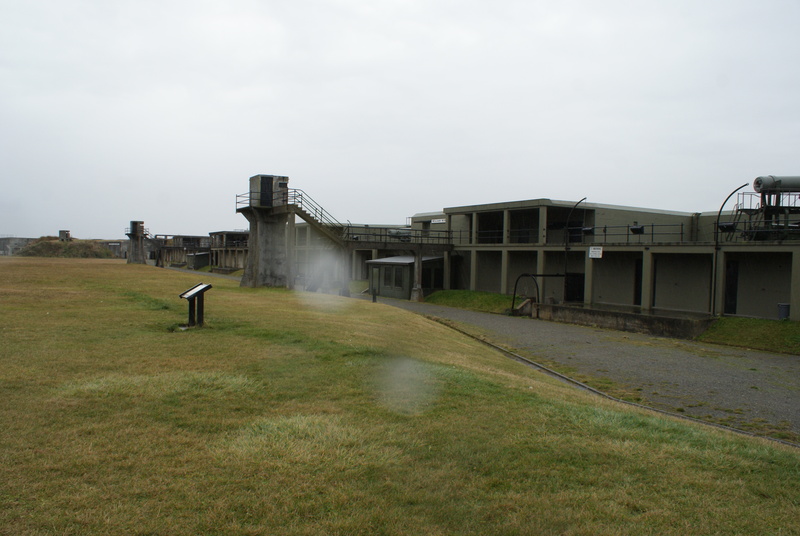 It felt good to have some warm liquid as we were still a bit chilled from walking around Fort Casey. I need to get back there again and re-hike the Wilbur Trail; it travels through some wonderful Old Growth, and I remember it being beautiful and interesting. We took the ferry back over the Sound, and made it home before dark. Even though we didn’t do any hiking, we enjoyed getting out into nature and having another adventure. It was a treat to have Daddy along this time, too.